REDDING, Calif. - Simpson University’s women’s softball team placed six players on the California Pacific Conference’s All-Conference team and claimed three of the conference’s top four honors. 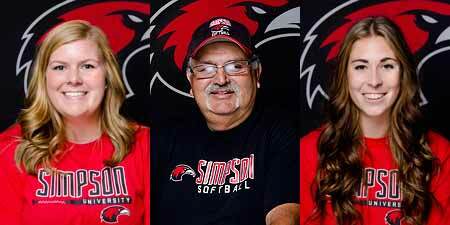 Ryan Norton, a junior business major from Ceres, Calif., was named Player of the Year; Paris Hallums, a freshman from Rescue, Calif., was named Pitcher of the Year; and Simpson softball coach Wayne Stower was named Coach of the Year. Norton, an outfielder, batted .611 in conference and .477 overall, ranking her 20th in the nation, according to Cal Pac News. She was also 17th in the nation in hits per game at 1.537 and averaged more than one run per game. Hallums finished 11-2 overall with a 2.16 earned run average, Cal Pac News reported. With 8.44 strikeouts per nine innings, and opponents only hitting against her .204, she was ranked 18th in the nation. Norton and Hallums were joined on the All-Cal Pac team by Kara Wall, Courtney Thomas, Chelsea Dunn, and Kaylana Mah. The Red Hawks won their third straight Cal Pac Conference title this season and have advanced to the NAIA Softball National Championship’s opening round, starting in Irvine, Calif., on May 12.